Heartbreak is like your favourite (albeit now banned) pack of instant noodles. They’re a soupy hot mess that makes your stomach drop as if it were made of lead. The hell you’d experienced when your midnight snacking was brought to an abrupt halt is possibly similar to what romantic rejection brings. Research says that the anguish experienced during heartbreak activates the same part of the brain that is stimulated during addiction. You see where am going with this. See, my addiction is food. I eat when am stressed, grieving and exceptionally bored. And the only way to jerk oneself out of such a heartbreaking soup induced coma was to get out. 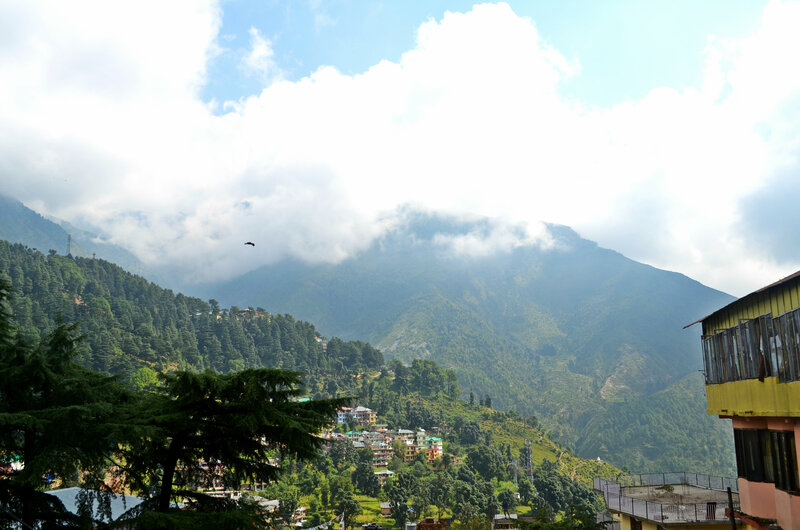 The quickest, fastest hilliest escape is the one place I’ve always found myself – McLeodganj. Here’s a little background – My history with this little piece of Tibet dates back to the wonder years – I’d just stepped out of college, freshly bitten by wanderlust when I made my first solo trip to the town. Needless to say, I was hooked. Here’s what I found : a place for candid introspection called the Tsluglakhang temple, inspiring stories of Tibetan settlement and hopes of reclaiming their motherland. But most of all, the inviting aroma of fresh pancakes with Pink Floyd calling you to shine on, you crazy diamond. Balm to a troubled soul. Yes, the pressure was immense. Not only was I expecting to relive my first journey of self discovery, but I was hoping to glutton my way out of an aching heart. – Cool new graffiti and wall art. Paint activism away! 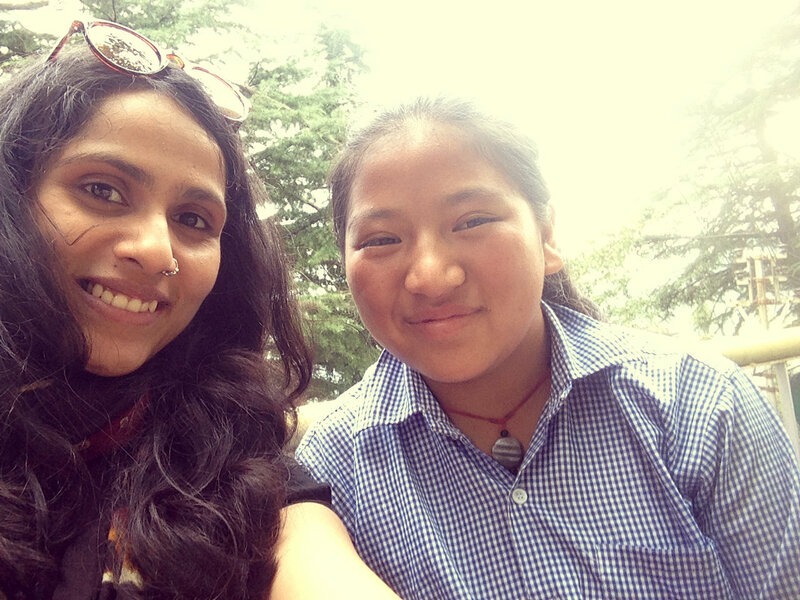 McLeodganj 2010 and 2015 (L-R) Different faces, similar smiles, and my hair looks so much better! Get ready for non-stop gluttony, long hours of reading/writing/colouring till you’re hungry again! My new found Israeli friends call this condition ‘The Zombie’ Not so much the drink, but the hours you spend really doing nothing. However, if you want to make your stay more memorable or distract yourself from your aching heart here’s my list of things to do in 48 hours, covered over the two blog posts. Or you can just laze and soak up the sun and be stationary. Pls don’t be stationary. A caveat when choosing a place to stay – ask if there’s any construction around. Chances are you’ll have to sleep through extremely loud drill and machine noises, cause that little piece of land next to your lodge will have yet another ‘hotel’ coming up to screw your view. Sorry, lack of sleep makes me cranky. I stayed at a pretty place called 8 Auspicious Him View. The hotel was nice but the neighbouring lodge was an absolute nightmare. Nosier than a 24X7 kitty party. Remember, food is something you’ll be doing a lot of. So pace yourself. I’d suggest Italian, there’s plenty of it. But be wise to order. Since I was revisiting my favourites, my first stop was Nick’s Italian Kitchen. So the view is still awesome as is the honey lemon ginger tea, but I wish I could say the same about their pastas or pizzas (the last time they’d packed me a simple but fresh margarita pizza for my journey back home. I’ve never relished a pizza so much) Unfortunately their pasta in Pomodoro sauce was fairly disappointing which tasted like ketchup gone bad. I’d recommend sticking to their cheese based sauces. If you’re up for abandoning their ‘Italian’ food, I suggest trying the Tibetan. Even though its vegetarian, their momos and thukpas are still out of the world! Work off those heavenly carbs by taking a walk down to the Tsuklakhang temple and bask in the afternoon sun. Sit outside on one of the benches and marvel at the picture perfect landscape in front of you. Breathe. Feel the good vibes. Smell the butter in the air from the lamps light around the temple. And meet Pema. What does your heartbreak compare to now, globetrotting cupcake? I suppose that’s two hearts in need of a prayer. Its time for a long introspective walk..
That will invariably lead you to coffee. Walk into Woeser Cafe and be inspired by Sangmo who bakes with a passion known only to a true blue dessert buff. Innovative chocolate and fruit desserts, tarts and bars along with some daring flavour combinations. And not to miss the vegan desserts & drinks. 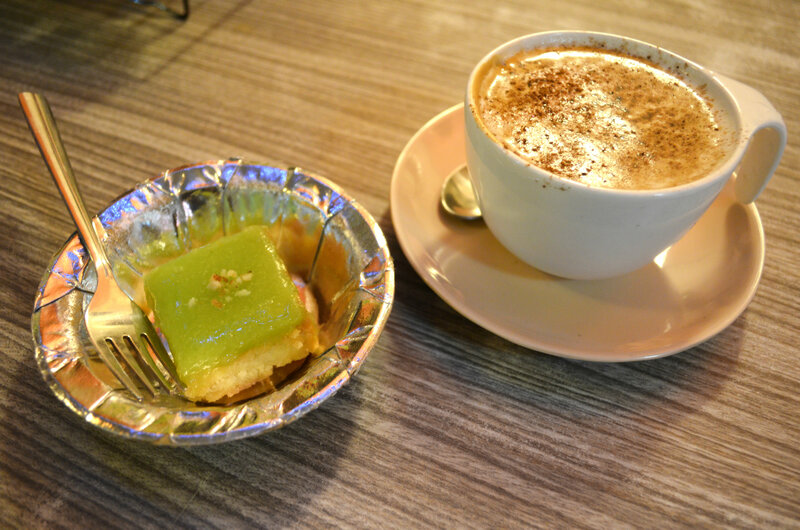 My favourite bites are the lemon tart and chocolate-chilli lollipop washed down with a very special cup of hand whisked coffee, which in my opinion is waaaay better than anything a machine can possibly make. Now the biggest disadvantage of travelling solo (literally the only we’ll speak about it) is the limit of your appetite. Seriously, if I were Adam Richard I’d have got it on with every item on the menu. But just as I was about to give up hope, two people walk in with a raging appetite, one of who was vegan! And as always, we got talking. So what happens when two hungry people + 1 glutton are seated across desserts on display? This time, you take a guess! Not only were my newfound Israeli friends an absolute riot to hang out with, but they were most…un-Israeli. Complaining about living among too many of their own “Its like I never left Tel Aviv!”, planning a trip to the Andamans (note to self) they spoke passionately of using solar energy to make a difference. Very unlike the fresh out of army, ganja crazy close knit group of Israeli tourists usually seen in these parts. Over cups of soy milk coffee, cardamom cake and walnut tarts, I realized that friends can also be found in a dimly lit basement cafe, and that some people can handle more spice than me. Like way more. I end my day with dinner at Lung Ta for vegetarian Japanese. Yes, you heard that right. And its freakin delicious. This has always been a favourite. And its so refreshing to see nothing has changed! 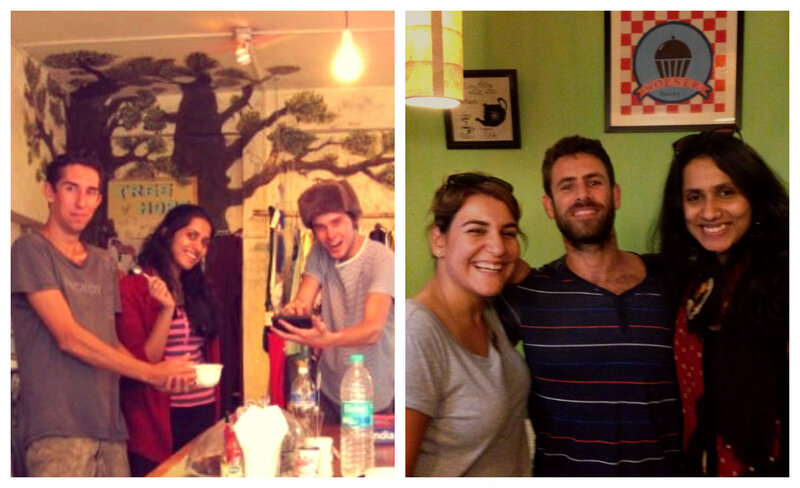 Same interiors, the same people and the same variations of tofu. I recommend trying everything on their menu atleast once (pls don’t do in asking for sushi) but if you’re confused, try their set menu. 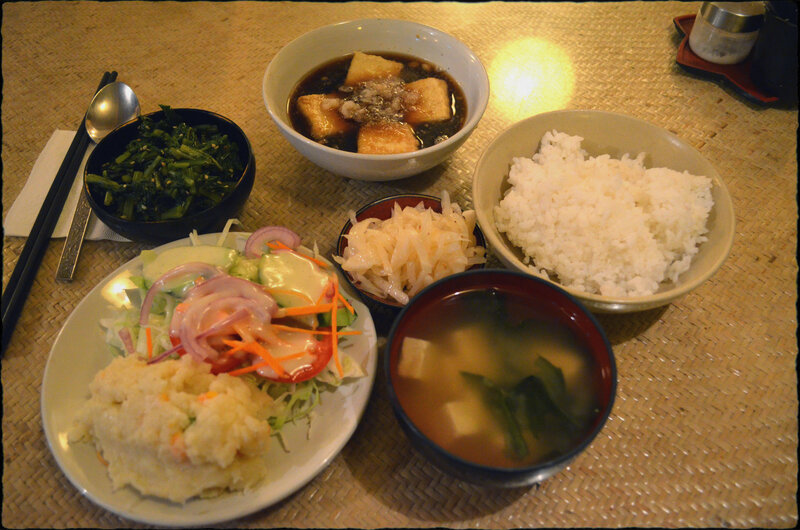 I tried the Agedashi Tofu (soft tofu coated with potato starch and fried, dunked into a soy based sauce), Ohitashi (cooked spinach salad), Miso Soup along with a potato salad and steamed rice. 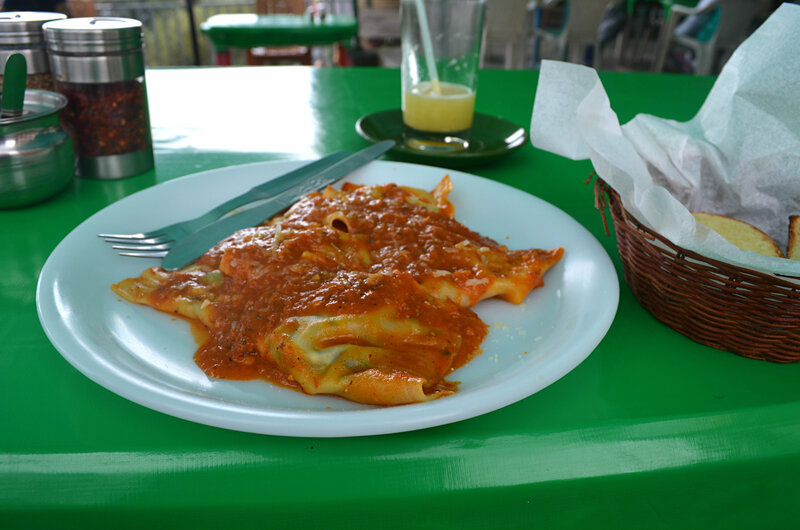 The meal was fresh and simple, yet full of flavour. Almost like a soothing lullaby to a hectic day. A crappy week promises a happy ending. With a tummy full of food I could slowly feel my heart make its way out of my stomach and back to its designated place. There is a good chance I am healing. There is a better chance my stomach had to use that heart occupied space for dessert.